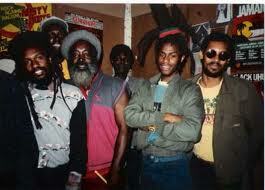 Reggae group steel pulse was formed in 1975 by David Hinds, Bsil Gabbidon and Ronald McQueen. It was formed at Handsworth Wood Boys School in Birmingham, England. David was the lead vocals and he also did most of the song writing, Basil Gabbidon was lead guitar also vocals and Ronald McQueen was the bass player. The group first release was "Kibudu", "Mansetta" and Abuku all of which was released on a small record label call ".Dip"
They got their internatiio fame through Tom Terrell. He served as their manager and was instrumental in masterminding the U.S. premiere of Steel Pulse on the night of Bob Marley's funeral, which was broadcast live around the world from the 9:30 Club, 930 F Street, N.W., Washington, D.C. on May 21, 1981. In 1988, Steel Pulse released State of Emergency, their most explicitly crossover-oriented album yet. They also contributed the track "Can't Stand It" to the soundtrack of Spike Lee's classic Do the Right Thing. In 1991, they released another heavily commercial album, the Grammy-nominated Victims, which featured the single "Taxi Driver." Backing up the song's views, Steel Pulse filed a class-action lawsuit against the New York City Taxi and Limousine Commission, charging that drivers discriminated against blacks and particularly Rastafarians. Founding member Fonso Martin left that year, reducing Steel Pulse to a core trio of Hinds, Nisbett, and Brown. Their backing band still featured Ewen and was elsewhere anchored by guitarist Clifford "Moonie" Pusey, keyboardist Sidney Mills, trumpeter Kevin Batchelor, Saxophonist Jerry Johnson and Trombonist Clark Gayton. The 1992 live album Rastafari Centennial marked the beginning of a return to the group's musical roots, and earned another Grammy nomination. The following year, they performed at Bill Clinton's inaugural celebration, the first reggae band to appear at such an event. 1994's studio album Vex completed Steel Pulse's re-embrace of classic roots reggae, though it also nodded to contemporary dancehall with several guest toasters and a digital-flavored production. 1997's Rage and Fury continued in a similar vein, and was nominated for a Grammy. In 1999, the group released another collection of live performances, Living Legacy. Fast forward a long seven years since their previous album, Rage and Fury, Steel Pulse would return yet again, this time with African Holocaust, and yet again have their ranks dwindled. Core members David Hinds (vocals, rhythm guitar) and Selwyn Brown (keyboards, backing vocals) are the only ones to remain from the band's original line-up, but they more than hold their own and they're joined by a deep roster of supporting musicians, a list too long to list. As always, the music is what's most important, and on that count, this Steel Pulse lineup indeed makes the mark. Granted, it did take them seven years to get the album out, but still it won a Grammy Awards Nomination for Best Reggae Album of the year. There's really not too much else to say about African Holocaust. Longtime fans will know what to expect. Newcomers should know a few things: above all, Steel Pulse are known for performing well-written, Afrocentric songs that are rebellious without being negative or inflammatory, and though the band membership has changed over the years, the type of songs hasn't, nor has the steady move away from dancehall that was apparent on the band's previous album. the message and music remain true to the band's principles and vision.